We are keen supporters of being able to script and augment software. For Power Manager that translates into providing first class scripting support. When we recently added a sun observation trigger and condition, we took the opportunity to expose the internal calculator for use in your scripts. The value returned in myDate is a time and date. But where in the world is sunset happening at this time? The sun observation command defaults to the Royal Observatory in Greenwich, London; a suitable nod to the history of time keeping. I assume you will want to provide your own location. To do this we need a latitude and longitude. These are two numbers that pinpoint a specific location on Earth. There are many ways to find a latitude and longitude. Let's use OpenStreetMap, a wonderful free mapping resource on the Internet. 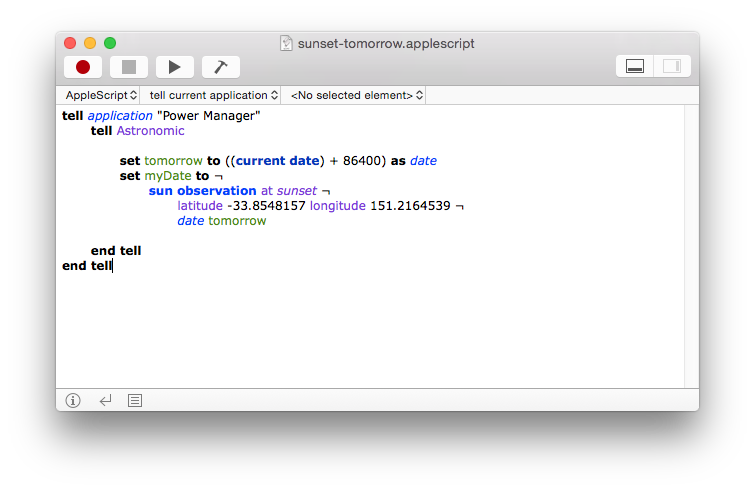 This AppleScript snippet includes two new parameters, latitude and longitude followed by the values obtained earlier. With the location provided, the time and date now returned for sunset are calculated relative to Sydney, Australia. The sun observation command accepts one more parameter, date. 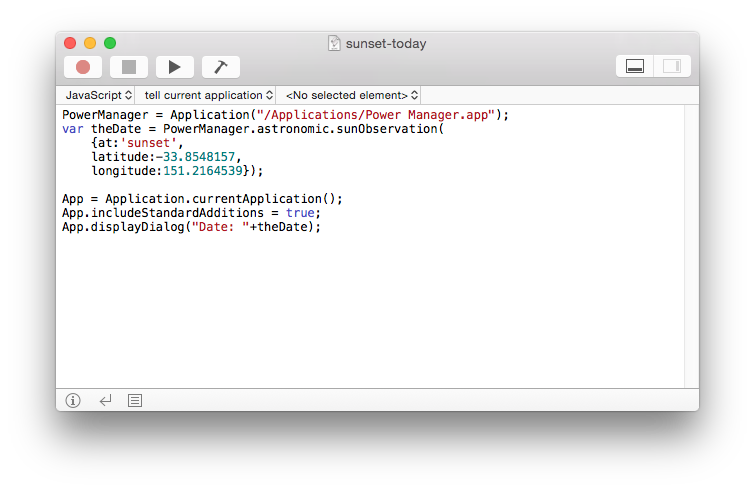 The date parameter lets you calculate sunset on any day in the past or future. By default, the date parameter is today. In the script above the value 86400 is the number of seconds in a day. Before asking for the sun observation we take the current date, add one day in the form of seconds, and call that tomorrow. As you can see, Power Manager's new astronomical calculator is flexible enough to be useful beyond its intended use of triggers and conditions within your schedules.